Do you need simple but highly efficient ways to handle your personal finances and manage your money effectively for today’s economic challenges? So many people have trouble trying to stick to a budget month after month, and if they try, they always fail. Many people also have trouble with impulsive spending and that causes them to break their budgets. 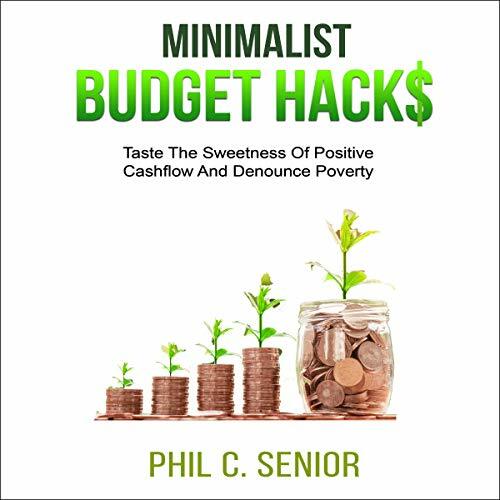 Minimalist Budget Hacks: Taste the Sweetness of Positive Cashflow and Denounce Poverty offers you the best minimalist budget strategies to rise above financial circumstances that seem beyond your control, redirect your life, and help you know what it takes to achieve financial freedom. This book will help you get your finances in order, so you can finally stop living from paycheck to paycheck. It provides practical steps for overcoming negative spending behaviors and helps you build critical thinking skills for financial freedom and greater personal happiness. After listening to this, you’ll be able to stick to a budget and save like a pro. It will arm you with proper money management techniques and help you prioritize your financial goals to creating wealth. This is not just a book that tells you a story about saving money and budgeting, it is one of those rare practical guides that has the power to change anyone’s life within a short period.